Free Libre Open Source Lebanese Movement: One month until LibrePlanet! Schedule and t-shirt design announced! Women's and men's styles available. We posted the complete schedule, so you can start thinking about which sessions you'd like to attend. This year's conference will be jam packed with great talks like "updating Mailman's UI," "fighting surveillance with free software," and "mapping for social justice." Make sure you check out the social events, including a Saturday night party and raffle. We finalized the design for this year's t-shirt! Register online by March 5, 2014 to pick up a shirt, or buy one at the conference. If you can't make it to Cambridge, you'll still be able to livestream the conference and watch recordings of the sessions afterwards. 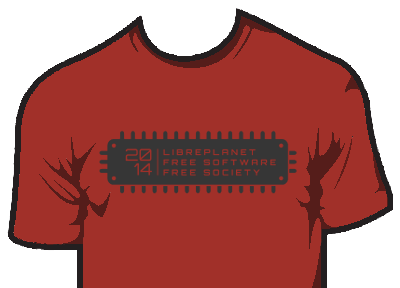 We encourage you to bookmark our streaming portal, libreplanet.org/2014/live. Participating remotely doesn't require any kind of registration. Looking to coordinate travel with other LibrePlanet attendees? Brainstorm ideas for lightning talks? Organize a get-together after the conference? Join the libreplanet-discuss email list to connect with other LibrePlanet attendees. After LibrePlanet, the list will become a place for discussing the conference and sharing ideas for next year. If this sounds good to you, I hope you register for LibrePlanet. Don't forget that becoming an FSF member will make your admission gratis and support the FSF's work year-round. LibrePlanet starts now! Join us online.